Flor Sanchez has for 55 years been a resident of 304 East 126th Street in East Harlem, where most tenants want to join a local community land trust. Across New York City, from the Far Rockaways to the South Bronx and from Bushwick to East Harlem, low-income communities are showing increasing fascination with the community land trust model. One might even call it a movement. Coalitions have emerged like the New York City Community Land Initiative (NYCCLI), an alliance of academics, affordable-housing developers and community activists who educate the public about community land trusts and advocate for their inclusion in city policy. Meanwhile, longstanding affordable-housing developers, like the Ridgewood Bushwick Senior Citizen’s Council, are working on their first community land trust projects. And high-profile elected officials have become champions of the model, including Comptroller Scott Stringer and Speaker Melissa Mark-Viverito, whose neighborhood rezoning plan lists community land trusts as a central demand. Councilman Donovan Richards is drafting legislation to define community land trusts in city law. The community land trust is a new concept for many New Yorkers. Under the model, land title is split from the title of the buildings on the land. A nonprofit entity—the land trust—is created for the purpose of owning the land title and enforcing the terms of the ground lease, which typically contains stipulations to ensure the buildings on the land remain affordable in perpetuity. The trust’s board includes a mix of the land’s residents and other neighborhood stakeholders, who together balance the interests of residents with those of the wider community. In some ways, it’s simply a legal arrangement to ensure permanent affordability, an “added layer of protection,” as says Harry DeRienzo, executive director of Banana Kelly and a member of NYCCLI. But it can also represent something more: a way of “taking land out of the speculative market,” as says NYCCLI member and CUNY professor John Krinsky, and placing land in the control of communities—a way to achieve stabilization in neighborhoods wracked by cycles of disinvestment and gentrification. It’s not the first time community land trusts have excited New York neighborhoods struggling with housing insecurity. In the ’70s and ’80s, faced with landlords’ widespread abandonment of the housing stock in the Lower East Side, the Lower East Side Catholic Area Conference organized local residents to rehabilitate city-owned properties and establish a community land trust. The Cooper Square Committee, founded in the 1960s to propose an alternative to the city’s demolition plans for the neighborhood, after long negotiations with the city established a mutual housing association and community land trust that continues to thrive to this day, with 328 apartments. Starting a community land trust movement was more straightforward in that era, when land remained in abundance. Now that public land is scarce and the price of private land exorbitant, one might wonder if New Yorkers have returned to the concept a little too late. The amount of publicly owned land still available for development is highly disputed. A report released in February by the comptroller’s office documents over 1,100 vacant public lots that could be developed with affordable housing, but city officials say only 670 of those lots are suitable for development and that development plans are already underway for 400 of those sites. Whatever the number of public lots, it is no secret that the city has far fewer undeveloped parcels than it once did. Community land trust advocates, however, are not fazed by that fact. They envision a variety of ways to make New York City a bigger part of the widespread adoption of community land trusts. Finding land to use might be less of a challenge than convincing the de Blasio administration, eager to efficiently reach its target of building or preserving 200,000 units, to throw its weight and resources behind their model. NYCCLI members, drawing on the lessons of earlier Lower East Side community land trusts, see a variety of contexts in which they believe community land trusts could play a useful role. The first is the city’s troubled Tenant Interim Lease (TIL) program (now revamped as the Affordable Neighborhood Cooperative Program). TIL, launched in 1978, provided the tenants of buildings abandoned by their landlords an opportunity to form cooperatives and buy their buildings from the city for $250 a unit. Yet 154 buildings remain in the program, with some struggling to make it to the cooperative phase for a variety of reasons, such as not meeting the requirement that 80 percent of existing tenants attend cooperative homeownership trainings. Picture the Homeless, a leading member of NYCCLI, has found at least two Tenant Interim Lease (TIL) buildings in East Harlem where tenants are eager to leave the TIL program and become residents of a community land trust. 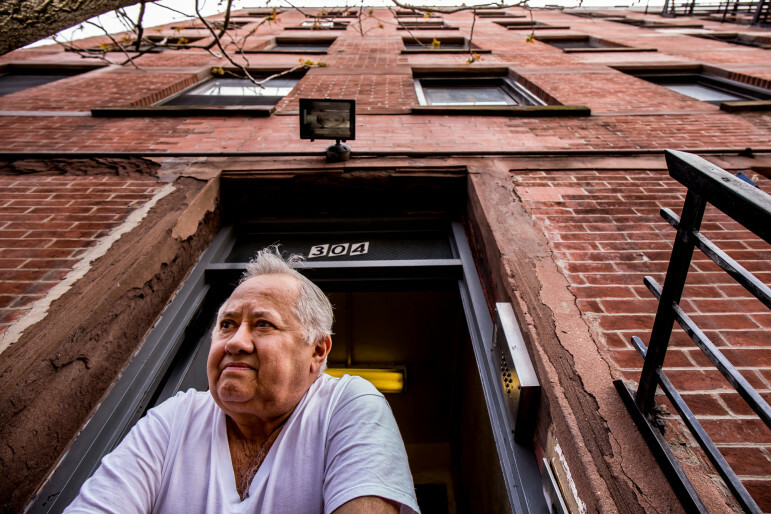 One of those buildings is a half-empty tenement on East 126th Street, where tenant association leader Flor Sanchez say most of the remaining tenants are seniors who have trouble attending the required trainings. Picture the Homeless has proposed that the city transfer the buildings to a mutual housing association (a nonprofit entity governed by a mix of residents and community members) with the land title invested in the East Harlem/El Barrio Community Land Trust, incorporated in 2014. Such a structure, says DeRienzo, would provide TIL residents with “all the rights of the cooperative but all the protections of rent-stabilized tenants and all the benefits of being the members of a mutual housing association.” In other words, under the new structure, tenants will finally have a say in how their buildings are managed, will continue to pay deeply affordable rents and—as members of one, multi-building association—will save costs by achieving economies of scale. A second place where advocates hope to employ the community land trust model involves struggling low-income cooperatives, including some that managed to graduate from the TIL program but have yet to find stability. According to Ridgewood Bushwick Senior Citizen’s Center’s housing director Scott Short, such cooperatives sometimes wrestle with ineffective governance, with some tenants too focused on survival to participate in the affairs of the coop, and others taking advantage of their power to serve personal interests. Running such a coop is also a financial challenge, with tenants often unable to afford the cost of major repairs. In addition, many cooperative buildings are at risk of losing their long-term affordability because their bylaws lack resale restrictions. Some apartments, originally bought from the city for $250, have been sold for millions of dollars to income-poor, savings-rich newcomers. NYCCLI members think they can address a variety of the problems associated with single building coops through the creation of “scattered-site cooperatives” coupled with community land trusts. Under such a model, cooperative owners remain shareholders of their individual buildings, but save money by sharing costs across multiple cooperatives. The board of the community land trust includes a mix of cooperative owners and other community stakeholders, providing greater accountability and preventing corruption. In addition, the community land trust lease creates resale restrictions to limit the apartment sales prices. In Bushwick, UHAB and the Ridgewood Bushwick Senior Citizen’s Council are about to launch such a scattered-site cooperative community land trust with 18 buildings formerly abandoned by their landlords and foreclosed by the federal government. A third demographic that the community land trust model could serve is distressed homeowners and landlords who have fallen behind on their property taxes. Until the 1990s, the city foreclosed on homeowners and landlords who fell behind on such payments. Then Mayor Giuliani changed this policy; instead of seizing troubled properties, the city began selling the liens on unpaid taxes to a private investment trust. Critics say the tax lien sale can be devastating for low-income homeowners, who are charged exorbitant interest rates until their debt is repaid to the trust, forcing many homeowners to sell their homes to private equity firms. “It’s the opposite of a housing preservation plan and its predatory like you can’t believe,” says Krinsky. NYCCLI is trying to persuade the city to end the tax lien sale, return to the practice of seizing troubled properties, and turn them over to community land trusts. The city already has one mechanism to do this: Under the Third Party Transfer (TPT) program, the city transfers severely distressed, tax-delinquent properties to new “responsible owners.” Mayor de Blasio’s housing plan promises to ramp up the use of the TPT program and to transfer more properties to non-profits. Since de Blasio took office, the city has initiated one round of foreclosures of tax delinquent buildings, and properties that do not enter payment agreements may enter the TPT program. “[De Blasio’s] Housing New York plan has a bunch of good ideas. And a lot of what we’re trying to do is hold the administration to some of the good ideas that it has,” says Krinsky. For all the benefits of community land trusts—and for all the ways that advocates say they can be put to use—they are certainly no magic solution to the city’s housing woes. “There’s nothing about a land trust that makes it more cost-effective than any other affordable housing program,” says Andy Reicher, executive director of UHAB. Community land trusts still depend on city subsidies and grants like everyone else—and they can still can go broke and disappear. Replying to City Limits’ requests for information on the administration’s approach to community land trusts, the Department of Housing Preservation and Development (HPD) offered little* besides saying that the agency is looking at the model and engaged with groups in East Harlem and Edgemere, a neighborhood in the Far Rockaways where the city is leading a post-Sandy neighborhood revitalization effort. Advocates have expressed optimism about the administration’s apparent openness to the discussion. While perhaps not as engaged with nonprofits as some would like, it has shown more of an interest than prior administrations in working with nonprofits and finding non-speculative uses for public land. “Until the de Blasio administration, the city has always looked on properties as something to be disposed of,” says Val Orselli, the director of the Cooper Square Mutual Housing Association. He said he’d even heard HPD had started a community land trust working group. * CLARIFICATION: HPD did arrange for City Limits to conduct a brief interview with HPD Commissioner Vicki Been about community land trusts and portions of that interview have been added to this story to provide a fuller understanding of the agency’s role. HPD did provide substantial information we requested about the in rem, TIL and Third-Party transfer programs but declined to provide further detail about the agency’s involvement in community land trusts. The city announced its selection of developers for the Inwood library site on Tuesday, two weeks before Community Board 12 will vote on the Inwood rezoning.